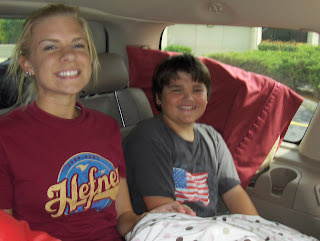 Kayleigh & Christian headed to camp! Today was Summer Fun Day at TCC. 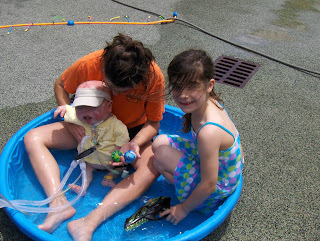 They set up baby swimming pools, sprinklers, misters and had some water guns to add to the fun. Maddie and Fletcher 'swam' together for the very first time! Maddie loved it, Fletcher not a fan of the swimming pool. 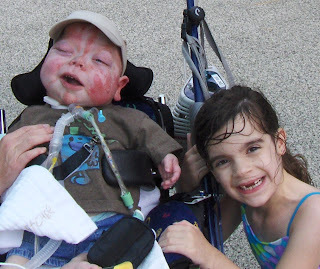 I think mostly because he love, love, loves to take walks and we had to take him out of his wheelchair to put him in the pool with one of his teachers, Miss Jennifer. After Fletcher got out of the pool I took him back to his unit to change his clothes. Miss Jennifer and Miss Kelly played with Maddie while I was gone with Fletcher. I'm so grateful for the wonderful staff at TCC. They so didn't have to play with Maddie but they did and she had a blast! Thank you girls for loving my children the way you do!